2）Tulip Chair: Fiberglass shell and base with cushion padded, with optional armrest. The table is made from fiberglass base with marble faceplate. It's not only suitable for indoor, but also for out usage, as the marble faceplate is strong and endurable. There are several sizes for choice. Fiberglass swivel base or fixed base supporting by a plating pole. Shell is molded fiberglass, with the fabric or leather cushion, offers a relaxed and comfortable seating. With arm or without arm for choice, you can also mixed match with the tulip table. We've already sent the furniture price list to your e-mail box, please check it. 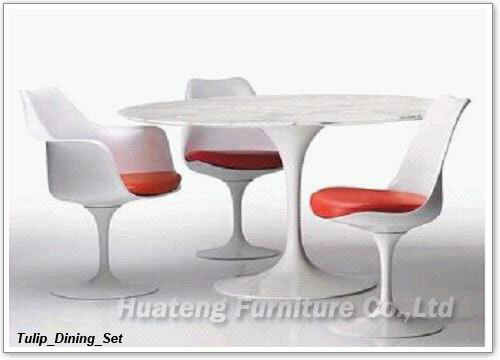 Could you please send your e-mail address to my mail: crystal@huatengfurniture.com? So that we can send you the price list directly! Thank you!